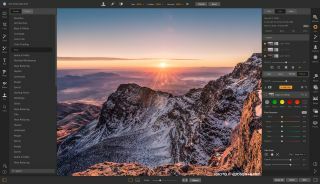 ON1 continues to develop its all in one photo editing and organising software at breakneck pace, and its latest version, ON1 Photo RAW 2019, really takes the fight to Adobe Lightroom. Like Lightroom, Photo RAW is available for both Mac and PC, and can both organise your images and edit them non-destructively. Unlike, Lightroom, however, it also supports image layers and the ability to combine and blend images with masks. In effect, it does the work of both Lightroom and Photoshop, and the 2019 version brings substantial updates to these layer tools. In previous versions, layers were handled as a separate module, but now they’re integrated with the Develop and Effects modules. You can work directly with raw files as layers, while keeping full access to the raw data. Each layer can be moved, resized and masked while retaining its non-destructive edits. ON1 has also introduced automatic layer alignment based in image content and a focus stacking feature so fast, the company claims, that you can adjust image focusing in real time, just as if you were refocusing a lens. The Effects module gets new filters including a dedicated film grain filter, curves and colour adjustments and new AI masking options due to arrive in December promise to make subject selection easier than ever. Also new is a dedicated Portrait mode with face detection, retouching, skin smoothing and eye and teeth enhancement tools. ON1 Photo RAW 2019 will have a new Master Keyword List for managing keywords and a new text tool for creating posters, adding bylines and creating annotations, for example. ON1 is very keen to tempt Lightroom users, and has developed AI-powered algorithms to migrate existing Lightroom adjustments into ON1 Photo RAW while keeping them non-destructive and editable. This is to overcome the migration hurdle faced by Lightroom users with countless image adjustments they don’t want to lose. If ON1 has managed to pull off this technical challenge it will be quite a coup, and we look forward to trying out this Lightroom migration process for real. There’s more diversity in the image-editing market now than ever, and ON1 Photo RAW 2019 looks like a very strong upgrade. It’s available for pre-order now at a special price of $99.99 ($79.99 if you’re upgrading from an earlier version). Interestingly, ON1 is also offering a value-added ON1 Plus Pro membership for £129.99 per year (regular price $149.99). It will also be available as a 30-day free trial.